GVB launched its new “I Am Guam” campaign last night. This is the campaign logo. What do you think? I like that there isn’t a coconut tree, a Guam seal or a latte stone in it. My guess is yellow=sun, blue=sea, and green=island. I like it. I’m not sure I dig the font used for the word Guam. Sources tell me GVB has spent hundreds of thousands of dollars on this new campaign and are working with two stateside firms in efforts to revitalize and boost Guam’s tourism industry. I really hope it pays off. Can’t wait to see the ads and collateral materials. not bad…bowls? i was impressed by GVB’s marketing angle, or at least the theory behind it. we had GVB in-studio tonight and Gerry Perez talked about the development of the logo, saying it’s intentionally abstract to mean different things to different people. i agree josie, the font is the weak point. like it was stuck to the bottom as an afterthought. the right font can make or break an idea. here it doesn’t help. I was thinking that they looked like a row of colorful kayaks. It’s a day later and I still don’t like the font. It’s dated. I don’t see bowls or kayaks. I see the bottom curve of the sun sinking into the curve of the ocean settling against the curve of the island. Like they all fit together or are connected (if that makes sense). um, don’t like it. i think guam’s selling point is its ancient history. it IS unique. it IS a guam thing. how many other places have their own ancient language? looks like AT&T on it’s side. but what do i know? i am just a dog in chicago. i don’t work for a fancy media firm. so i guess i better leave it up to the experts. The colors are symbolic. To me they stand for the sun-yellow, sea-blue, and land-green which conveys a message of getting back to the basics. I don’t think the symbolism says anything about the island’s culture. If you ask me, the money would have been better spent here on Guam. There are enough professionals such as Josie here that could have done an incredible job. The talent is already here on Guam. Shame they didn’t put out a bid for local companies to do the marketing. I wonder why GVB Director Gerry Perez just fired his assistant Marcel Camacho. Might it have had something to do with the hiring of the 2 stateside firms? Oh well, I guess we’ll never know as it is a personnel matter. I still think Gerry Perez is doing an outstanding job despite the obstacles of a global recession and a shrinking tourism market. Personally I think there are larger things at play in world and the island’s tourism industry is going to prove how the industry isn’t a reliable stream of revenue for the government. The slogan “I am Guam” is a rip off from the 2008 movie Beowulf (I am Beowulf) which was a rip off from the movie 300 (This is Sparta!) which was a rip off from the movie Kingdom of Heaven (I am Jerusalem). If this is the best of what a couple of hundred of thousands of dollars buys, then ‘Max Havoc: Curse of the Dragon’ was a genius design in marketing campaign. Please..quit having your brain storming sessions at the karaoke clubs and start putting some real effort into marketing. this might be crazy, but I immediately thought the shapes look like (or represent) the tops of latte stones, tying it to Guam history. If they had bolded the font and pulled it closer to the shapes, i wouldn’t hate it. Here’s the $49.00 version made with automated logo software from stock graphics and colors. I’m at a miss on the creativity of this design, even considering that yellow is sun, blue water, green grass and brown land? When I first saw the logo I thought it looked familiar. Then the ad popped on my email homepage as it had so many times before…the yellow, green and blue curve. This registered trademark however does not represent elements of the Island of Guam. 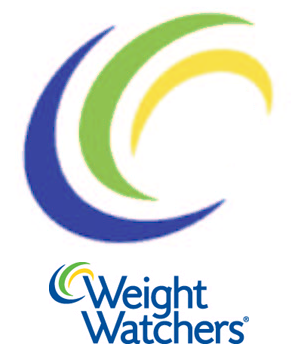 I’m not sure what the brand manager or corporate at Weight Watchers felt the colors meant? 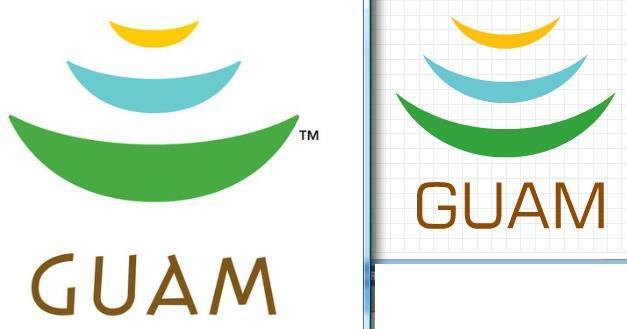 I hope the Guam Brand Investment and analysis is right that the logo will mean different things to different people and not become confused as the Guam branch of Weight Watchers! Forget rebranding the agency. You want real change? Cut staff and numbers serving on the board and move GVB to Adelup and set up skeleton crew to operate a tourism kiosk at the airport. Turn the current GVB building into a much needed territorial museum. I agree with Thomas Angstrom – that there are a lot of qualified pros (and amateurs) on island to get the job done right. Why not invest these darn dollars back into Guam and its own talent?! It gets so ridiculous, sometimes I feel like we get what we deserve. Bleh. You think Guam’s tourism troubles are bad, just check out this Current TV news feature on Saipan. Guamanians are lucky landowners are able to sell land to foreign investors who have money to invest. Fortunately, Guam’s economy will also be more dynamic than its Micronesian neighbors partly because of the military defense spending and the revenue generated from that sector as well as our so so tourism industry. I’m certain other islands would sell their daughters in order to generate the amount of money poured into Guam’s economy by military spending on island. Suffice it to say, Guam could also use a boost in the arm with other viable industries besides what it already has in place. Unfortunately that also comes with a price. Sometimes that price comes at the expense of our quality of life. It’s Ugly!!! What a waste. Reminds me of the thousands the University of Hawaii system spent to have different firms redesign the their logo (not the “H” logo), only to, at the distaste from the public of those designs, choose the old logo anyway. Oh yeah, this design is really ugly. I don’t like it, though. There seems to be little or no uniqueness about it. It can have the power to intrigue or repel. Repel, because it may cause uncommon vistors to think of Guam as boring.